EXSYS Tool, Inc. will showcase two of its highly versatile, precise and efficient tooling innovations during the EASTEC show in West Springfield, Massachusetts, from May 14-16. Visitors to booth 5340 will experience how the EXSYS Compacto base holder and the company’s PRECI-FLEX modular tooling system significantly reduce setup and tool change times for CNC turning centers. EXSYS Compacto is available in C3, C4, C5 and C6 sizes and suitable for all standard PSC (Capto) adapters. It features the industry’s shortest PSC interface. Compared to traditional base holders, the EXSYS Compacto connection interface offers more available space and clearance, even for larger work pieces. It also provides improved torque transmission and rigidity for increased tool accuracy. The polygon-shaped connection of the EXSYS Compacto further increases its high precision and on-line or off-line quick change. For optimal accessibility, a special built-in release mechanism on the outer spindle diameter of the EXSYS Compacto enables operators to lock and unlock the adapters with a small torque key for fast, virtually effortless tool changes. The automatic ejection of the adapters further increases speed and efficiency of tool exchanges. Changeover and setup take place solely in the face of the tool holder, eliminating obstructions to save time and money. The EXSYS Compacto is available for all older and current turning centers. EXSYS’s well-known PRECI-FLEX modular tooling system was the first of its kind on the market with a single base holder and multiple tooling adapters that utilizes the ER collet pocket. It offers a fast, accurate and cost-effective solution for lathe tooling changeovers. The short, compact design ensures maximum torque transmission and rigidity, resulting in increased machining accuracy and improved productivity. Additionally, PRECI-FLEX’s conical and flat face planar interface allows the use of either an adapter or a standard ER collet, and enables collets, endmill holders, expanding collet chucks and shrink fit tooling to be mounted on a single base holder. Available in a range of sizes, PRECI-FLEX provides unsurpassed repeatability, with every toolholder offering repeatability within five microns. 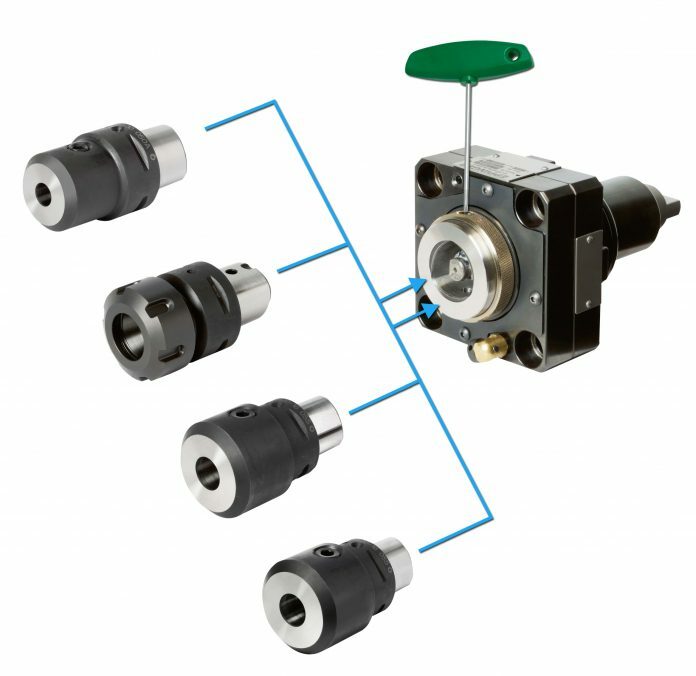 The system also virtually eliminates machine downtime and allows tooling adapters to be interchanged between fixed and rotary base holders for fast, economical machining. Founded in 1987, EXSYS Tool, Inc. is the exclusive importer of German-made EPPINGER solutions, including high-precision live and fixed toolholders for CNC turning centers, modular adapter systems for quick lathe tooling changeovers and gear box solutions for a wide range of applications. With headquarters near Tampa, Fla., and support offices in California, Canada and Mexico; EXSYS offers a variety of different types of tool holders, gold-standard tooling repair and applications expertise to manufacturers throughout North America. For more information, please contact EXSYS Tool, Inc. at info@exsys-tool.com or visit www.exsys-tool.com. Next articleThe Workhorse of GE’s Additive Portfolio – M2 Cusing: 3D-Metal Part Production Laser Printer Available Now!